Trustee recruitment is arguably one of the most important governance challenges that any board at a charitable organisation is likely to face. Trustees are the people who lead charities, the people who decide how the charity is run and, ultimately, the people who safeguard the charity’s future. It is therefore absolutely essential that the process of trustee recruitment is one that is carefully planned and thought-out. In this article Paul Wormald, Charity & Not-For-Profit partner at Hawsons, answers some of the frequently asked questions surrounding trustee recruitment and the process involved; providing a detailed guide to trustee recruitment. Where should I look to recruit new trustees? There are a number of ways you can advertise a new trustee vacancy, including on several free websites, such as Charity Job, Trustee Bank (for NCVO members) and Third Sector. You should also utilise your networks (and that of current trustees). Do not just rely on word-of-mouth; use a range of different channels. Advertising to a small network, or using only word-of-mouth, can sometimes lead to a board full of similar people, with similar ideas. 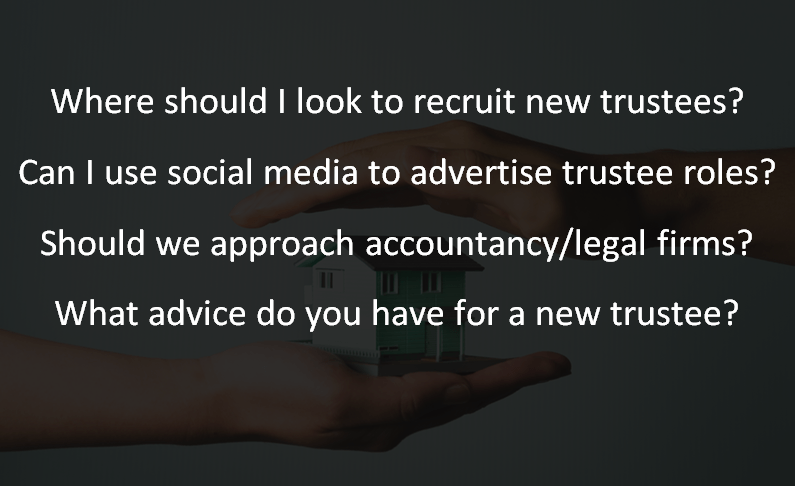 Can I use social media to advertise trustee roles? Absolutely. Social media, particularly LinkedIn, is an excellent platform in which you can ‘connect’ to potential trustees. You can do this by promoting the vacancy through posts (get current trustees to help with this) or groups and also by looking at an applicant’s prior experience on their LinkedIn profile page. We are looking to recruit a trustee with financial/legal experience, should we approach accountancy/legal firms? There are a lot of accountants and solicitors who become trustees and approaching them directly – whether on the phone or through email – is certainly an avenue you should consider. How vigorous should the trustee interview process be? Once you have reviewed applications and created a shortlist, you will begin the interview process. This should be an informal, yet robust, interview process – particularly for any positions which involve the charity’s finance. Ensure that you check references and have a set interview process in place. Discuss the charity, its aims and be honest about the duties and time commitments expected of the new trustee. What would you say are the most important trustee skills and attitudes? Although there are some general skills and attitudes you should look for in a trustee, such as integrity and passion, to fully understand the diverse needs of your organisation you must carry out a skills audit. This will help you to identify gaps and consider what skills you will need to bring to the team to fulfil your strategy. For example, if you are looking at developing your website you may be looking for a trustee with prior web development experience and/or IT skills. A board with varied skills, perspectives and backgrounds is usually advised. I am looking to become a trustee, how should I get in contact with charities? Trustee positions are always being advertised so look on charity websites and across social media – particularly LinkedIn groups such as Young Charity Trustees. You should also use your networks to speak to current trustees you know, or people who can introduce you. What advice do you have for a new trustee? Attend events, talk to staff and listen to your fellow trustees before trying to force through new ideas. Get to know the charity and its work first. Also, do not volunteer for too many things! It can sometimes be daunting as a new trustee, but only volunteer for things that you have the time and skills for. The first steps any charity’s board should make when recruiting a new trustee is to layout a timetable for recruitment, conduct a skills audit and then draft a role description for the vacancy. This will help to ensure that the board and the prospective trustees understand the role and recruitment timescales. Afterwards, review the process for recruiting your new trustee. Ask yourself what worked well, what didn’t work and what could have worked better, and then adapt the process accordingly. Also, always remember: what worked before won’t necessarily work again, so don’t keep all your eggs in one basket!